So, listed in no particular order of importance, I will tell you my TIPS! The last comment I want to make about scraps is be selective about what you save- only keep the pieces that are easily used. GO ahead and throw away the tiny and oddly shaped pieces. 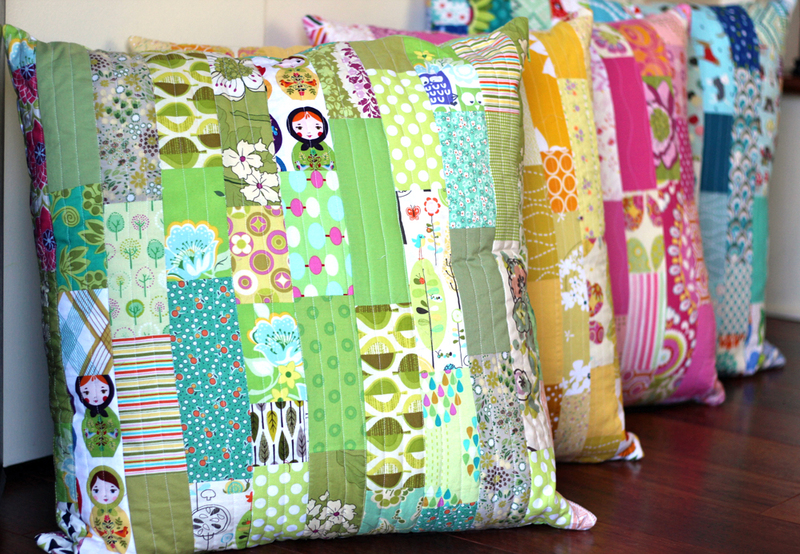 AND, think about making scrap projects- you don’t want to do patchwork with a bunch of different weights of fabrics so be selective- i only save large scraps of duck cloth or knit because they aren’t going to mix well in a scrappy patchwork project like a bunch of quilting weight pieces will. 2. TOOLS. 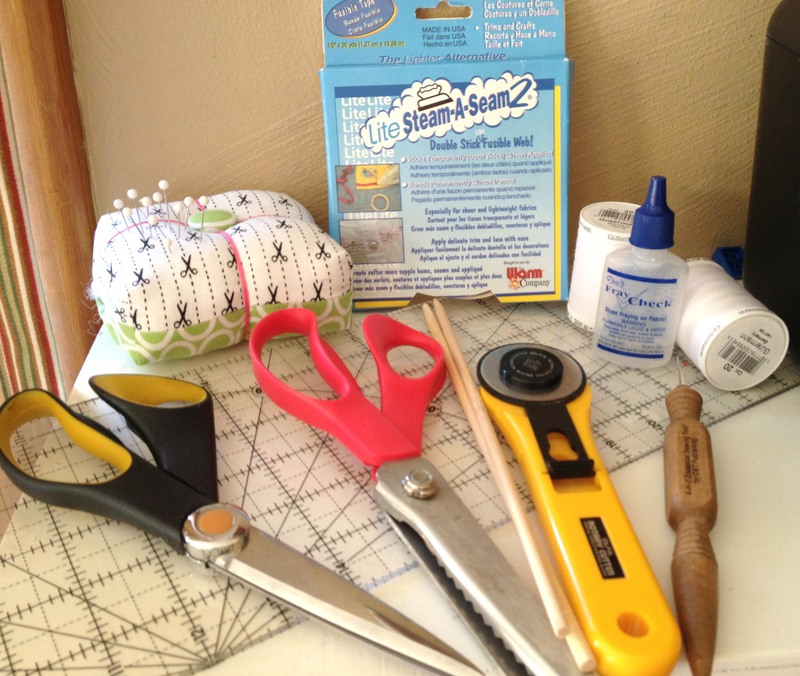 Some of us love a variety of sewing tools and others get by on the very basics. 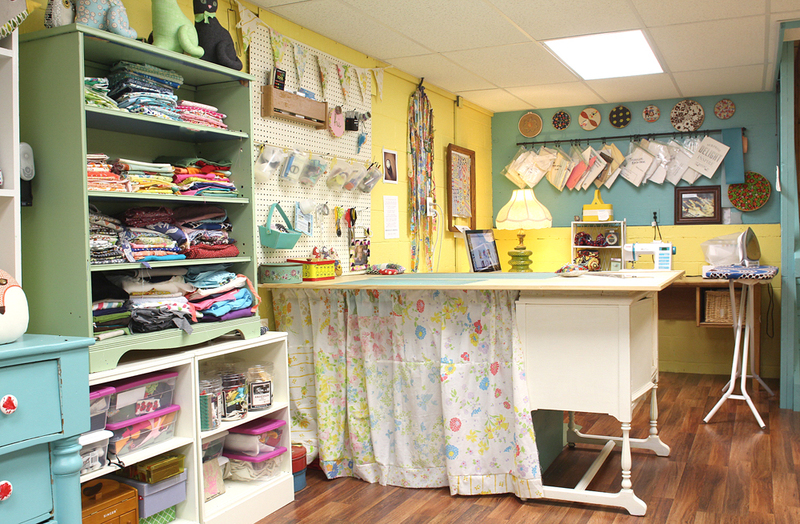 I am somewhere in the middle and often lose favorite things if my sewing room gets particularly disorganized. Where do they go I ask you?? Well I usually find them when I put some work into cleaning my sewing room but in a flurry of creativity, they are bound to go missing again! Here is how I keep my tools handy on one of these peg board things above my work table. 4. Next you need a spot for your folded up fabrics and you trims, zippers, etc. In the photo below you see all my folded up fabrics on the green book shelf and below are a bunch containers holding trims, zippers, webbing, felt, buttons, and others odds and ends. I have started being more selective about trims and gotten rid of a bunch of old hand me down things that I was keeping for nostalgia (i’m talking vintage 70s stuff that I just couldn’t make work). So, if those containers start over flowing again, I know it’s time to purge! Honestly, the fabrics have never been a big problem for me. Keeping them nicely folded, yes, but this shelf is plenty big enough for me. I am not someone who hoards and buys tons of fabric. If that is one of your issues (and you are not alone because TONS of sewers love having yards and yards of fabric, you might have to get extreme on your organizing like this or this! Or, if you have a small space, this would work great. 5. 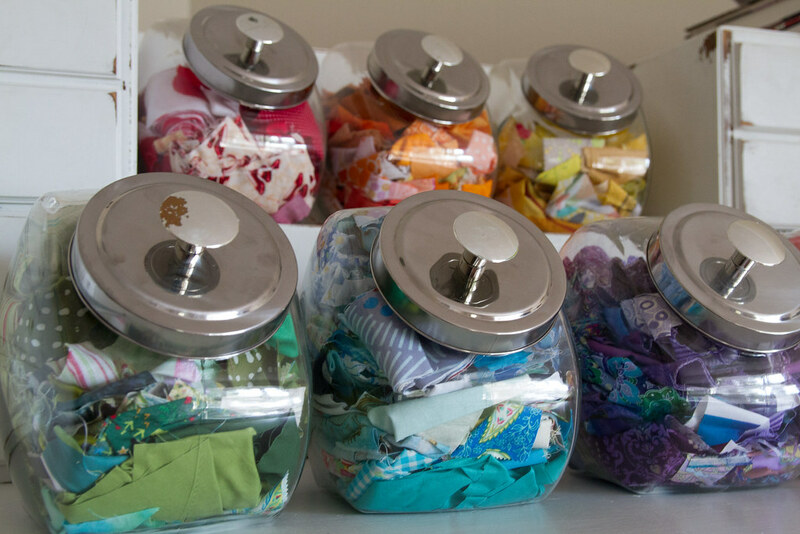 I’m not sure if this is considered being organized but it is a super helpful feature of your sewing room set up that i feel like adds to organization. You know how your kitchen is supposed be set up in a triangle? The stove, fridge and sink? Most kitchens are set up this way basically. It helps with your cooking work flow! Well, I think the same is true with your sewing room except with your machine, ironing board and cutting table. 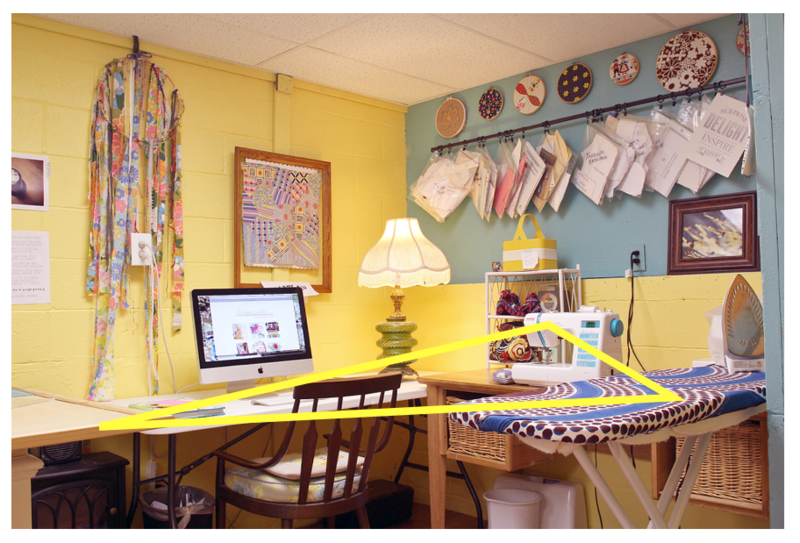 This keeps things tidy and work more efficient since you move around in the triangle to do your sewing work. Try it! It will help for sure! I have never advised about organizing before since I am only a moderately organized person! But, I have been sewing a long time and my sewing supplies stay in pretty good shape! I think my goal is to able to find things that I need, see the materials i want to use, and have plenty of space to create. So, I hope this tips may have helped you a bit at least! 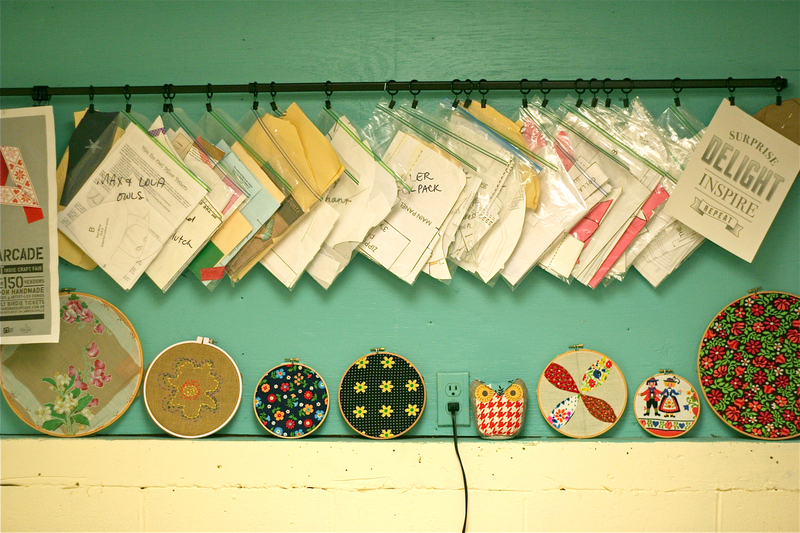 What sewing organization tips do you have? Give your best advice! Loved your post – definitely going to try the hanging patterns idea. 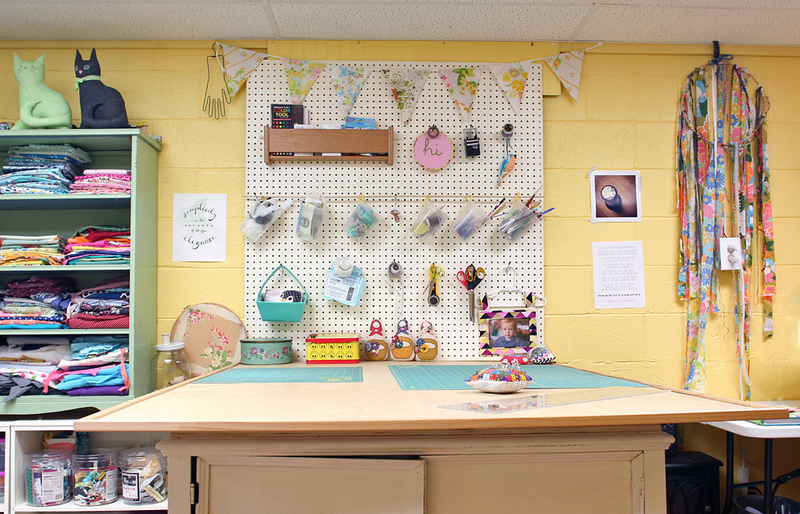 I just reorganized my room and hung up a peg board – makes all the difference! Love your patterns!